PORT OF SPAIN, Aug 21 2018 (IPS) - Guyana is forging ahead with plans to exploit vast offshore reserves of oil and gas, even while speaking eloquently of its leadership in transitioning to a green economy at a recent political party congress addressed by the country’s president. The mixed signals on plans for a green economy have increased in the past year, in the wake of a 2015 discovery of what has been termed one of the largest discoveries of oil and gas 120 miles off Guyana’s shores, which saw major international oil companies vying for exploration rights even as the government began work on a Green State Development Strategy. 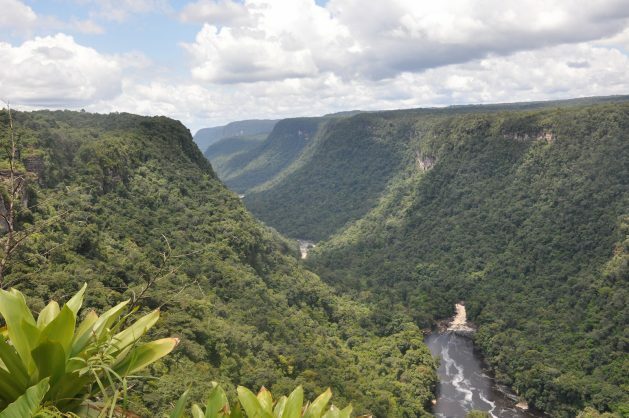 In line with its goal to transition to a green economy, Guyana entered into a seven-year partnership with Norway for a REDD+ investment fund, on the basis of its 19 million hectares of forest with a carbon sink capacity of 350 tons/hectare, in what it described as “the world‟s first national-scale, payment-for-performance forest conservation agreement.” The USD250 million investment fund from Norway is earmarked for pioneering Guyana’s Low Carbon Development Strategy. At the same time, government agencies of this small South American country, the only English-speaking one on the continent, gave some assistance to the International Labour Organisation (ILO) as it researched the most effective measures for ensuring the Guyanese labour force developed the skills needed in a green economy. The ILO agreed to respond to IPS’ queries about the seeming paradox of Guyana exploiting its fossil fuel reserves while making plans for a green economy, whereas repeated efforts by the IPS to obtain an interview with Guyana’s Office of Climate Change were unsuccessful. Andrew Small, the consultant commissioned by the ILO to carry out the study on greening Guyana’s labour force, told IPS via e-mail that he thinks the country is indeed ready and positioning itself for a green economy. He pointed to changes in the education curricula at both secondary school and tertiary level, as well as efforts at encouraging climate smart agriculture. “Guyana is indeed a small country but a major contributor to the global effort to reduce carbon emissions from economic and social activities,” he said. He also pointed out the move by some large businesses to incorporate renewable energy into their buildings and processes, and an attendant move by the government to enable further uptake of renewable energy. “In particular the Guyana Energy Agency and Guyana Power and Light Company are leading the final draft and implementation of the Draft Guyana Energy Policy (2017) and Guyana Energy Sector Strategic Plan (2015-2020), respectively. These policies outline anticipated energy demand, an optimal energy mix for Guyana including a 100 percent increase in renewable energy sources aligned to Guyana’s transition to an environmentally sustainable economy,” he said. Apart from labour market concerns, it remains to be seen how Guyana will live up to its Nationally Determined Contributions tabled last year. The country promised “to avoid emissions in the amount of 48.7 MtCO2e annually if adequate incentives are provided”, on the basis of its forest cover. If the four billion barrel estimate given is correct, Guyana’s reserves alone represent almost four-fifths of the Intergovernmental Panel on Climate Change’s 2007 estimate of the amount of energy that will be generated by Latin America’s industrial sector including its fossil fuel industry in the years leading up to 2030. The IPCC estimates the approximately 33 EJ of energy (roughly equivalent to 5.4 billion barrels of oil) Latin America will generate up to 2030 will result in 2,417 MtCO2 emissions, making Guyana’s promises in support of the Paris Agreement inconsequential in the light of emissions its billions of barrels would produce. The ILO commissioned the “Skills for green jobs” in Guyana study, which was completed in 2017, because his organisation believes a green economy is a sustainable one. “The ILO places great emphasis on greening of the economy and green jobs. This is critical towards sustainable economies and societies,” Sergeant said.